Have you experienced divorce, a broken relationship, or just nursing a broken heart because of marital conflict? ; Finished Divorce Care but still feel wounded? Then "Restoring Your Heart Support Group" is for you. Join us on Thursdays evening from 7:30-9:00PM to start the process of restoring your heart. Participants will learn why they pick the partners they do, the “dance” that is leading to the dysfunction in their relationships, and most importantly how to change their actions, so that they can change their life. The support group runs for eight weeks and ends with a team graduation.Come out to meet others going through the same struggles like you are, and work to edify and strengthen each other, so that your heart can be restored. Call us at 404-500-9204 to register for our group which is led by trained facilitators.The cost is $35/participant and includes a study guide. Are you under 40 years of age ?Have never married, but is from a family that has experienced divorce? Or are you from a family with several broken intimate relationships? Scared of getting married as you don’t want to become divorced? If you answered yes to any of these questions, then join this group to change your future. Children of Ruth facilitators will teach you what the bible has to say about marriage, the importance of honest communication in marriage, conflict resolution, and other tips to improve the likelihood that your future marriage will be successful. Call us at 404-500-9204 to join our next group. Have you experienced divorce, but have forgiven your ex-spouse? Are you now lead a rewarding and successful Christian life? In other words, what the “enemy meant for harm in your life, God is using for good". If this describes you, then we need your help to mentor other divorcees. On the opposite side, if you are newly divorced, struggling with your new life, and could use a listening ear, and a comforting shoulder, then join our program so that we can connect you with a Heart to Heart Mentor. We are seeking Heart to Heart Mentors and Mentees, both male and female, to provide mentoring and support to help to stabilize families who are reeling from divorce. Mentors and mentees must be willing to commit to one on one mentoring sessions for at least six months (frequency of contact will be agreed upon by mentor and mentee) and be able to be accountable to the Forgive for Health Team. Call us at 404-500-9204 to register and to help to stabilize our community. Join us on Friday nights at 7:30 PM for our forgiveness circles, where you will meet other forgiveness advocates, assess your forgiveness scores, study God’s word, and discuss forgiveness case studies. Case studies address topics such as forgiveness at work, divorce, forgiveness in marriage, submission, unanswered prayers, forgiveness after untimely death, etc. Session ends with a discussion on how the lessons from the case study can be applied to our lives. RSVP for the session and to get additional details on our meeting location by calling 404-500-9204. Ever wondered if you have forgiven someone who hurt you? Want to forgive, but not sure how? Then complete a forgiveness assessment and start the journey to total healing. 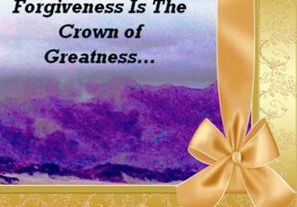 Call our ministries to receive a free forgiveness assessment, then use your scores to start the process of forgiveness. Clients are also welcome to participate in our monthly forgiveness seminars offered in churches, libraries, worksites, and other sites across our community. Visit the resource section of our website or call us at 404-500-9204 to receive a forgiveness assessment and to get a listing of upcoming forgiveness seminars in your area. Are you divorced, single, or just on a limited income? Need help in learning how to manage your money? Then give us a call. We teach individuals how to make their money work for them. We also show you how to work your way out of debt. Call us at 404-500-9204 to receive free customized Christian money support, so that the “spirit” on your money can change, and work for and not against you. In partnership with other community groups, we host a quarterly prayer breakfast where participants get a chance to “break” bread together, worship, and pray for the needs of our communities, nation, and world. Keynote speakers are featured to each event. Donations accepted and volunteers are also needed to make these events a success. Call us at 404-500-9204 to receive the event listing for the year. Are you interested in visiting new moms, shut-ins, the hospitalized, or nursing home patients? Then join us on our monthly visit to many that are ill or unable to care for themselves. God directs us to pray for the sick and to visit those are unable to come into God’s temple. Call us at 404-500-9204 for more details, and to join our team as we visit and minster to those in hospitals, nursing homes or the ill at home. Interested in spending more time in God’s word? Wishing you had a friend to discuss what you are reading? Ready to move to a higher place in Christ? Then our monthly prayer call and bible study will be of interest to you. Those interested in our monthly study should call us 404-500-9204 or email us at forgive4health@gmail to get our monthly bible study guide. Then join us on the 4th Saturday morning of each month at 12:00 PM at 1- 712-770-4875 x 679198 to study God’s word, and to pray for the needs of his people. Is unforgiveness affecting your health? Are you struggling with the “blues”? Gaining weight and not sure why? Need help with your diet? Then we can help. Call us for a free family consultation. Led by GA licensed dietitians and nutritionists, our team provides health coaching, diet counseling and medical nutrition therapy to help clients manage their overweight and obesity, diabetes, heart problems, hypertension, and other health concerns. Call us at 404-500-9204 to set up an appointment to see a Coach. We can bill Medicaid or Medicaid or work within our fee structure to provide you the services you need. Calling exceptional Christian men who are willing to offer counsel and support to others. Are you mature in your faith and ready to speak into the lives of others? Are you ready to be a "Paul" in the life of a younger Christian man? Ready to help our men to become all they were meant to be. If this describes you, we need your help. Call us at 404-500-9204 to learn more about our Men of Hope and Faith Group and to help struggling men to find their place in Christ. Want to host a book signing or forgiveness workshop at your church? Interested in getting our team to your family reunion; half way across the country? Call us at 404-500-9204 to share your vision, and we will try to fit you into our scheduled bus tours. In 2019, bus tours to FL,LA,TX, CA, and IN, are planned. Send us an online request using our "Contact us" form and we will work to visit with your group. In 2019, our team will also participate in a few short-term missions to serve across our nation and world. Do you have an Interest in joining our mission’s team and or donating medical supplies and clothing? Send us a note and we will work to make this happen. Call us at 404-500-9204 to get more details and to join our missions team. Help us as we work to make global disciples and to take the forgiveness messages to the ends of the world. Interested in reaching someone on our Speakers Bureau? Hosting a conference or workshop? Trying to find dynamic speakers and presenters? Call us with your needs, and we will work to match your needs to our list of speakers. Honorariums and donations encouraged to cover speaker’s costs. Give us a call within a month of your event, and we will help you to locate great conference speakers. Call us at 404-500-9204 to share your needs. Internationally, providing clothing to women, men, and children in Haiti, Jamaica, and Grenada. We also support Jacobs Ladder, Patricia's Drug Rehab Center, Walkers Place of Safety in Jamaica with food, clothing, and other other non-perishables. Locally, are funds tight in your budget ? Need some new clothes for an interview or just to wear to work? Then send us your size and let us see what we have in our clothes closet, that could work for you. Call us at 404-500-9204 to let us know what you need or stop by at noon on the second Saturday of each month. Also, call us if you have clothes to donate to our Clothes Closet. Join us as we clothe God's people. We volunteer with Loop Ministry and other local ministries at Christian concerts, the Food Bank, and other local Christian events as a way to pay it forward. Let us know if we can help your ministry by calling us at 404-500-9204. Of course, we are always seeking volunteers, so please call us 404-500-9204 to help us move God's work forward.